I’ll start first with a brief disclaimer. 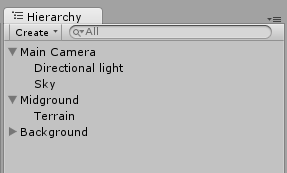 I’m going to assume that you already know roughly how to use unity. This will not be a tutorial for absolute beginners, so if you find yourself confused on how to do the Unity related parts, please try another Unity tutorial before asking questions here. Another disclaimer is that I’m also a Unity beginner, so if there’s a better way of achieving the things outlined here, please do let me know! Start by creating a new project in 2D mode and create all the usual asset folders. The bare minimum you need is an empty GameObject (mine is called “Terrain”), but I added a few extra components including a Directional Light and a Sprite for my background (“Sky” in the screenshot), and my Terrain object is a child of another empty GameObject. Check the screenshot below if you’re not sure. Next, create a new Script called TerrainGenerator. This will be where we do the majority of the work. Attach this script to your Terrain GameObject. Open up the new script and lets get cracking! I chose to expose a number of parameters to the editor which will allow me to tweak the terrain generation process without having to change the code. Add the following to the top of your script. Generating the heightmap is the core of creating the terrain. The heightmap will be an array of floats which specify the height of a given point. We will be using the Midpoint Displacement algorithm to create the terrain. Put simply, this algorithm recursively finds the midpoint between two points, and displaces it by a random amount. Each step of the algorithm takes the midpoint between the previously created point, and an existing one to create more granular changes, and the random displacement amount is smaller with each step. My implementation of the algorithm consists of two functions. One to set everything up, and another to recursively create the heightmap. The methods are listed in their entirety below. Now that we have a heightmap, we can use it to generate an array of vertices that represent the terrain. This is a pretty straightforward process, we simply loop through the heightmap and generate a point for the top and a point for the bottom of the terrain for each value. // the top and the bottom of the terrain. You may note that if you joined up all the points in the order they're given, it would look a little odd... after all, we're going top -> bottom -> top -> bottom ad infinitum. There is method to our madness though that'll be explained a bit later on. For now, just trust me! UV mapping - the process of mapping mesh co-ordinates to texture co-ordinates - has always been one of my least favourite parts of working with graphics. As such, a lot of this I stumbled across by guess work, so forgive me for some of the magic numbers in it. At some point I'll get around to refactoring them away, but for now they will do. // for the top and bottom. Notice how the UV points are generated in the same way as the vertex points (top, bottom). Doing it this way has essentially allowed us to treat the terrain as a series of slightly deformed quads, which makes UV mapping much simpler. The multiplying and dividing by various numbers controls how often the texture will be tiled across our generated terrain. You'll notice that we specify a texture for our mesh. The one I'm using can be found here. 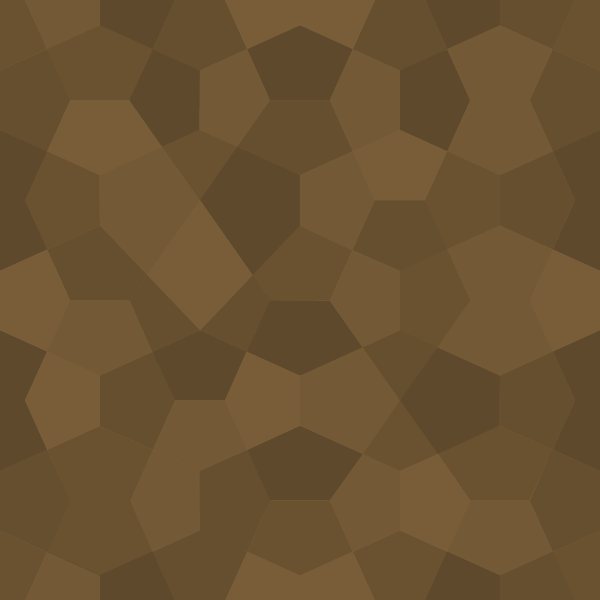 It is an adaptation of a texture I found called Congruent Pentagon hosted on subtlepatterns.com. If you don't see anything like the above, scout around for any errors, and take another look at the code. If you're with me so far, you may have spotted a difference between our current results and the picture at the beginning of this article. For a bit of extra eye candy, we can add a layer of grass to the top of our terrain. It's achieved in a pretty much identical way to everything we've done so far, but with a few subtle differences. Again, the code here could possibly be cleaned up, but for now it will do. 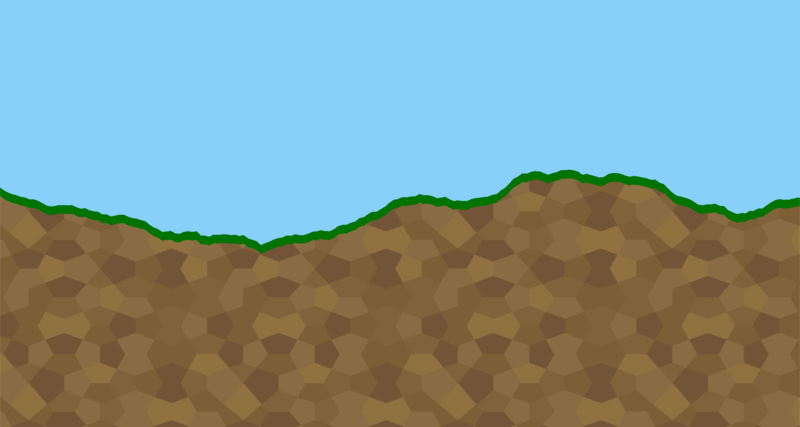 The code for creating grass vertices is almost identical to the code for terrain vertices, but with the exception that the bottom layer of vertices sits just below the top layer rather than at 0. The UV code differs in that the texture is applied once in it's entirety for each quad. The texture for the grass is another variant of Congruent Pentagon and can be grabbed here. If you run your scene again now you should see a beautiful bit of grass topped terrain. If not, you can view the full code listing here. Now, the next question is, what will you do with it! 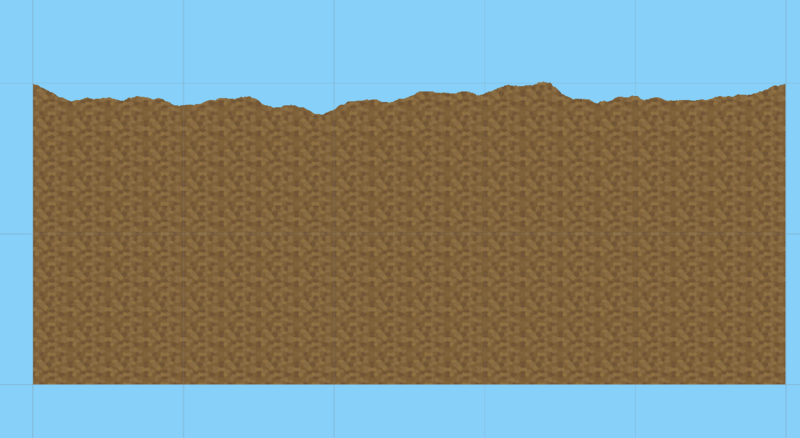 Some ideas for taking this further would be to have a go at generating infinite terrain. Have a script detect when the camera is about to reach the edge, and generate another batch of terrain to follow on from the first. Or, you could try adding collision detection to the mesh, add a bike and try out some motocross action! If you do create something cool, be sure to let me know in the comments below!